DETLEFFSEN -Orbis terrarum typus de integro in plurimis emendatus auctus et icunculis illustratus. DETLEFFSEN, J. - Orbis terrarum typus de integro in plurimis emendatus auctus et icunculis illustratus. Orbis terrarum typus de integro in plurimis emendatus auctus et icunculis illustratus. - DETLEFFSEN, J. Title : Orbis terrarum typus de integro in plurimis emendatus auctus et icunculis illustratus..
Map maker : DETLEFFSEN, J.. Size : 12.7 x 18.9 inches. / 32.3 x 47.9 cm. Description :Outstanding and rare example of a bible world map based on the Visscher bible map from 1657 (Shirley 401/414). 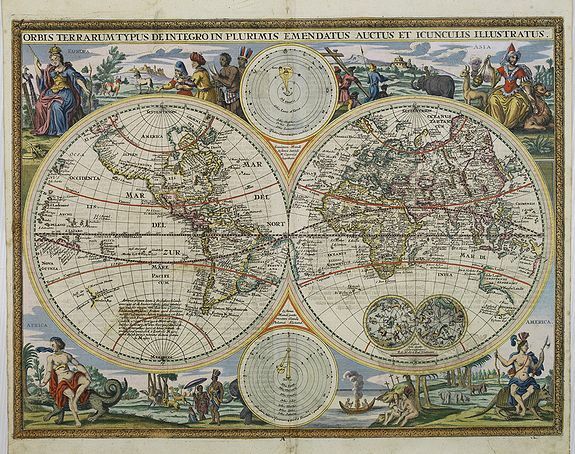 This map is larger in size and has an extra engraved frame around the original Visscher map. With the coastlines of Australia and New Zealand. Showing double-hemisphere world with two solar charts and two small celestial charts. Surround with allegorical representation of the continents. From a German bible printed in Minden by Johann Detleffsen in 1716. Condition : With German text on verso. Paper slightly age-toned.